This 1918 Aikin-Lambert has an unusual filling mechanism. It is a #2 Capitol Educator Clip-fill (Matchstick-fill) in Black Chased Hard Rubber. 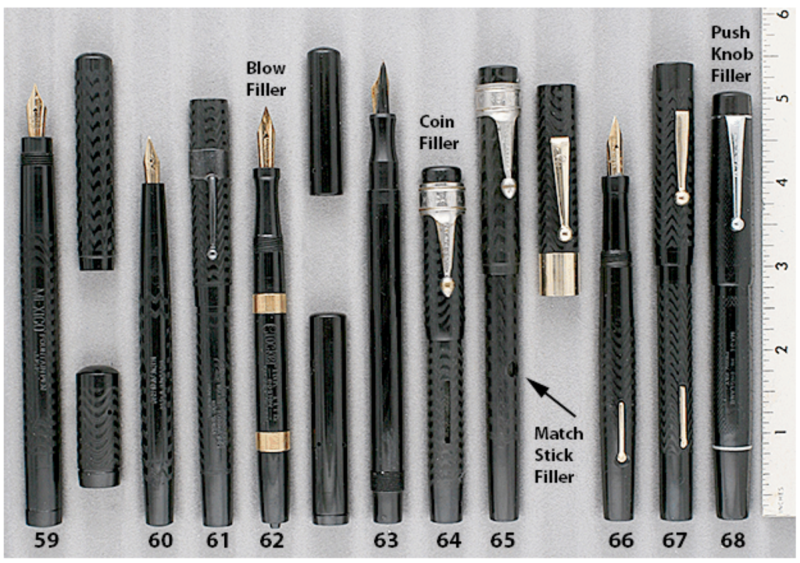 Aikin and Lambert, two NYC jewelers, combined around 1965 to make gold pens, introducing fountain pens in the 1880’s. They were bought out by L.E. Waterman in 1915. Here are the filling instructions: “Slide clip down to open end of the cap. Press ball of the clip through round hole in barrel, compressing the ink sac. Dip pen into ink a trifle beyond the end of the holder and withdraw clip gradually. The pen will then fill and be ready to use.” Signed ALCO, medium, flexible nib. New-old-stock. Mint. Item #65 in Catalog #84.